For the filling: Preheat oven to 400 degrees Fahrenheit. Place the yams directly on a rack in the oven for 30 minutes, until they are soft but not mushy. Allow to cool long enough to peel the skins off, and then slice the yam meat approximately 1/2 inch thick and place into a bowl. While the yams are still warm, toss with butter and 1/2 tablespoon brown sugar. Season with half of the Morton® Kosher Salt. In a separate bowl, toss together the onions, remaining brown sugar, balsamic, olive oil and remaining Morton® Kosher Salt. Spread them out onto a parchment-lined pan, cover with aluminum foil, and place in oven at 400 degrees Fahrenheit until they are soft and caramelized, about 20 to 25 minutes. Remove from the oven, and allow them to cool in any juices that they are sitting in. 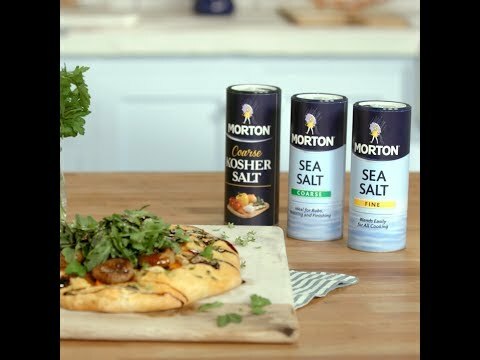 For the dough: Whisk together the flour and Morton® Fine Sea Salt. Work the cubed butter in by hand until crumbly and pea-sized. Drizzle in 5 tablespoons of water and combine until a dough comes together. Add the remaining water if needed. Pat the dough down into a disk, wrap in plastic wrap, and refrigerate for at least 1/2 hour. On a lightly floured work surface, roll the dough out into a 12-inch circle. Transfer the circle onto a parchment paper-lined baking sheet. To assemble the tart: Arrange the roasted yams in the center of the tart dough circle, leaving a 2-inch edge. Top the yams with the onions and any remaining roasting juices, and fold up the dough around the edges of the tart toward the center. Brush the edges of the dough with egg wash, and sprinkle with the thyme leaves and ground Morton® Coarse Sea Salt. Bake the tart at 350 degrees Fahrenheit for 25 to 30 minutes, until the dough is golden brown. Remove from the oven and allow to cool for 5 to 10 minutes. Garnish with arugula and parsley leaves, and drizzle the balsamic and olive oil over the top. Finish off with a touch of ground Morton® Coarse Sea Salt and freshly ground black pepper.